Generate consumer awareness and inform listeners of the new season launching on Prime TV. Unlike the TV show, the ZM announcers, guests and activities won’t be sealed off from the rest of the world…they will be on high profile display for everyone to see! We will put our Dome Ranger under the dome for 49 hours in the hub of downtown Auckland. 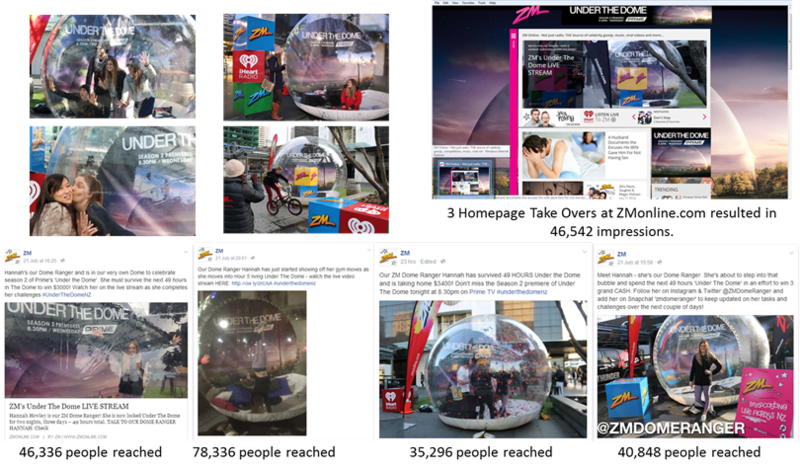 The literal representation of the Prime TV show premise will really bring ‘Under The Dome’ to life – helping drive awareness and excite listeners about the show. ZM focused on aspects of the human spirit that the Dome brings out e.g. fear, greed, heroism, altruism – and how extraordinary circumstances bring out the best and worst in people.